I received and advanced review copy of this title from the New York Review of Books. One group in the book that made a particular impression on me were the craftsmen such as the wheelwright, the blacksmith and the thatcher. It would seem that with the invention of cars that there would no longer be a need for such talents because of the shrinking reliance on horses and wagons for transportation. It was inspiring that these hardworking men decide to change with the times and find other uses for their crafts. The blacksmith, Francis Lambert age twenty-five, is a very talented craftsman and now that there are no longer horses to shoe in order to sustain his business he has diversified by making weather-vanes, gates and fire-screens. Francis is so talented that he is even sent to Germany to represent England at an international craft festival. Francis loves his job which is evident by the fact that he usually puts in sixty hours of work per week and he takes a great deal of pride in his masterpieces. As one would expect, hopes of escaping the village are expressed from some of the residents, but for the most part they seem content to stay in their small part of England. Several of them mention that their families have resided within the boundaries of Akenfield for generations. But there are also a fair number of voices we hear from people who, even though that have lived in Akenfield for many years, will always be considered “outsiders” because they were born elsewhere. Hugh Hambling age thirty who is a schoolmaster tells us that he was born on Norfolk. He and his wife move to Akenfield when he was twenty because he found a charming cottage that the newly married couple could afford. Hugh feels that the villagers are very private people and although he tries to engage them in discussions, he only ever is able to talk to them about cursory things like football or the weather. In the section on the school, Blythe includes the administrative records from the teachers and headmasters which date back to 1875. One problem, in particular, that teachers have to deal with is poor attendance by the children of farm owners. There are certain times of the year when even the young ones are needed to be out in the fields helping with the crop and later when a truancy law is passed these guidelines for school attendance are still not enforced. Outbreaks of health issues such as ringworm, diphtheria and scarlet fever are also recorded and must have certainly worsened the poor attendance issues. Many of the details that the residents of Akenfield provide are like no other that one would find in any ordinary history book. The orchard worker, for instance, gives us a detailed accounts of different apples that are best grown in the English climate and what the prime picking time is for each breed. The thatcher provides a lengthy description of the best way to thatch a roof and which are the best materials to use. I found the section on the bell-ringers particularly fascinating; these young men are in a way considered talented musicians and go around to village and neighborhood churches in order to practice their craft of bell-ringing. I had no idea before reading this history that there is such a fine art form to the ringing of church bells. This is a charming, interesting, candid glimpse into the pulse and essence of an English village in the middle of the 20th century. If you have any interest in British history, oral history or social history then this latest edition to the New York Review of Books classic titles is a must read. 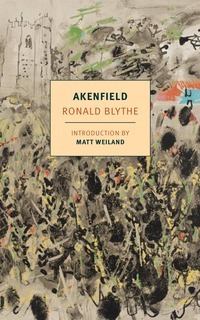 Ronald Blythe is an English writer, essayist and editor, best known for his work Akenfield: Portrait of an English Village (1969), an account of agricultural life in Suffolk from the turn of the century to the 1960s. He writes a long-running and considerably praised weekly column in the Church Times entitled Word from Wormingford. I kept seeing a Penguin copy of this book in my local charity shop. It appealed to me but I never bought it; the charity shop has since closed as well. With the NYRB version out I may have to read it. I’m not sure about the cover though. I agree about the cover–it’s a bit too abstract! I notice that there’s a book called Return to Akenfield, written in 2003 and which may be interesting for anyone who’s read the original. I’ve seen this is the library and thought it might be interesting, so I’m delighted you thought so well of it. Highly recommend! I would definitely grab it! I’ve seen this title floating around, but it hadn’t grabbed me. You’ve sold me on it now! Thanks so much for the compliment. I hope you enjoy it! This sounds like an interesting and really different kind of history. I’m worried it would be too narrow a topic for the book to stay interesting though! I’ve had that experience with some nonfiction, where there’s just more detail than I’m interested in.